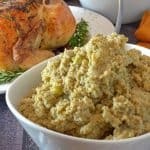 This Southern Cornbread Dressing , features cornbread as well as biscuits, chicken broth, and lots of sage. In addition to all the love in this family cornbread dressing, the other secret ingredient is sage and lots of it. Don’t be fooled by all of these luscious and savory ingredients because as you will learn, the biggest part of this holiday recipe classic is lots and lots of love. This recipe has been in the family of our guest for generations and as a matter of fact it was handed down from her 96 year old Granny, Nell Spence. 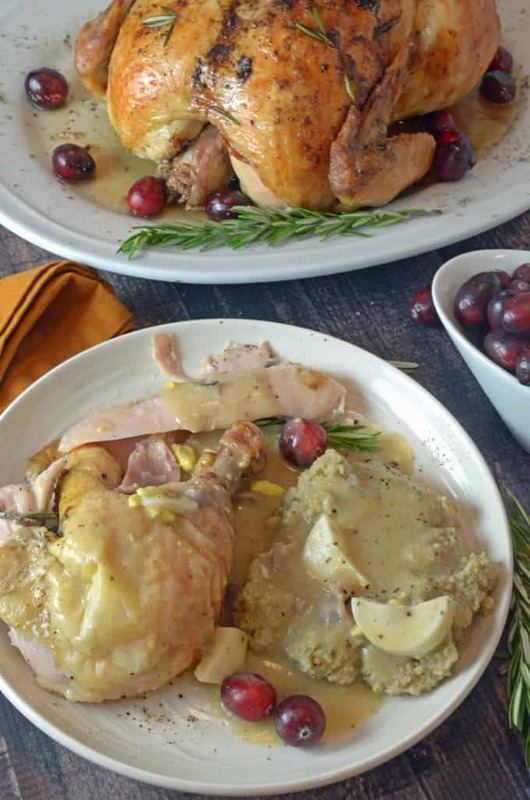 Take a look at this wonderful cooking video and then get out a big roasting pan as April Lee tells us all about this delicious and treasured recipe. Looking for a delicious spin on a traditional roast turkey? 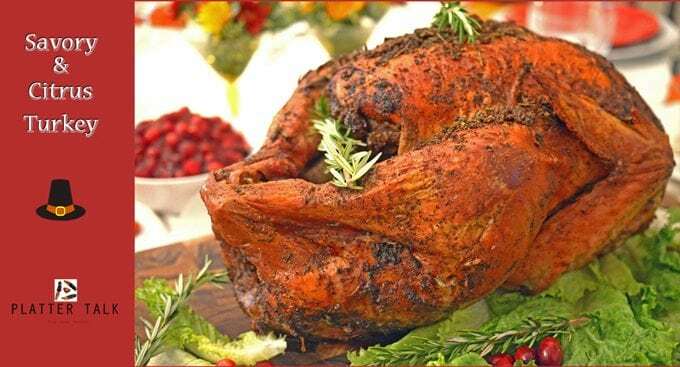 This Thanksgiving turkey recipe you must try. You’re going to love this simple and delicious Roast Turkey Recipe! We’re so blessed to have great friends in our lives and even more fortunate that many of them are great cooks. Take our friend April, for instance. You have met her in the past because she has done a couple of recipes for us, some time ago. We are speaking of her Chicken Fried Steak, as well as her Flank Steak Pinwheels on the Grill, and now April brings to our table this Cornbread Dressing Recipe. Now, we are honored to share this revered family recipe with you, our readers. Cornbread and biscuits are staples in southern cooking as well as this traditional southern cornbread dressing. I may be a Yankee, through and through, but I have had my share of southern eats and therefore I have gained a great appreciation of them. Whether its grits, collard greens, fried chicken, or the likes of such, there is no question that there is something special about southern cooking that sets it apart from all other cuisines. 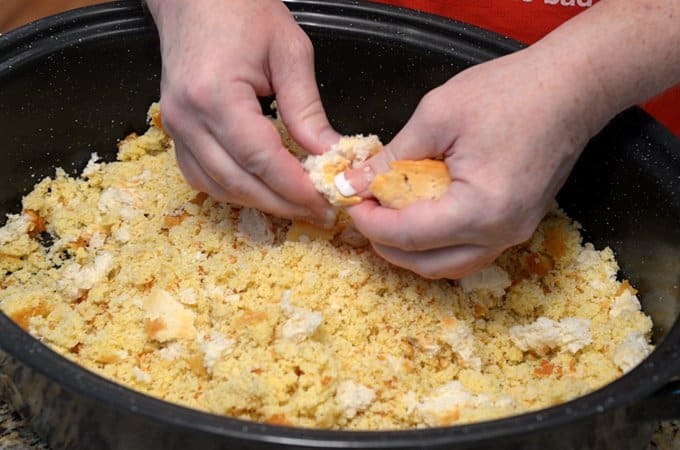 April shows us how to make cornbread dressing. We enjoyed this Southern Cornbread Dressing together with a roast chicken, some fresh cranberries and a salad. April’s two kids joined us, as well as their dad and throughout the dinner, each member of the Lee family related memories of growing up with this side dish. This is April’s preferred brand of cornbread mix, get the most from this family recipe and order some from Amazon today! 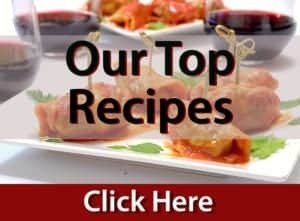 Platter Talk is an Amazon affiliate and receives a very small commission on any sales which helps us to keep bringing you the best recipes and food ideas around! 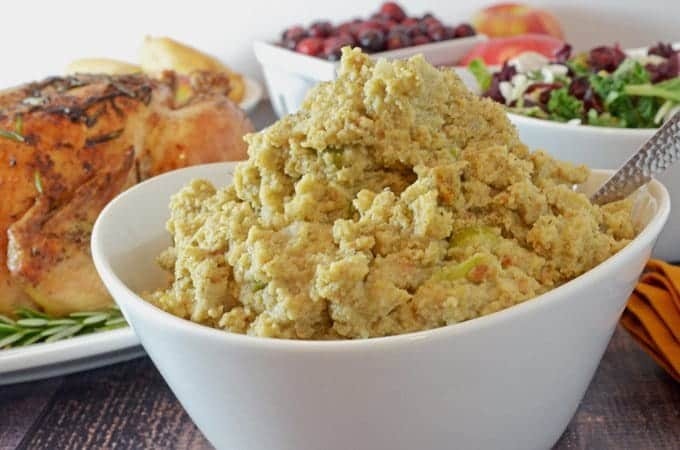 According to April and her family, this Southern Cornbread Dressing is delicious the next day and what’s more, it freezes well for future use. That dinner which featured this holiday side dish was a poignant reminder of the strong bond between great food along as well as its indelible role in family life. Thanks to the Lee family’s Granny, this Cornbread Dressing will therefore live on for many generations to come and with each and every helping, Granny Nell Spence will always be a part of it. April’s Southern Cornbread Dressing Recipe is made better only by one thing, as shown above her Giblet Gravy. See the recipe for the Giblet Gravy, here on Platter Talk. Plan ahead and freeze this cornbread dressing until the holidays arrive! Love Cornbread? Try this recipe for Jiffy Skillet Cornbread. 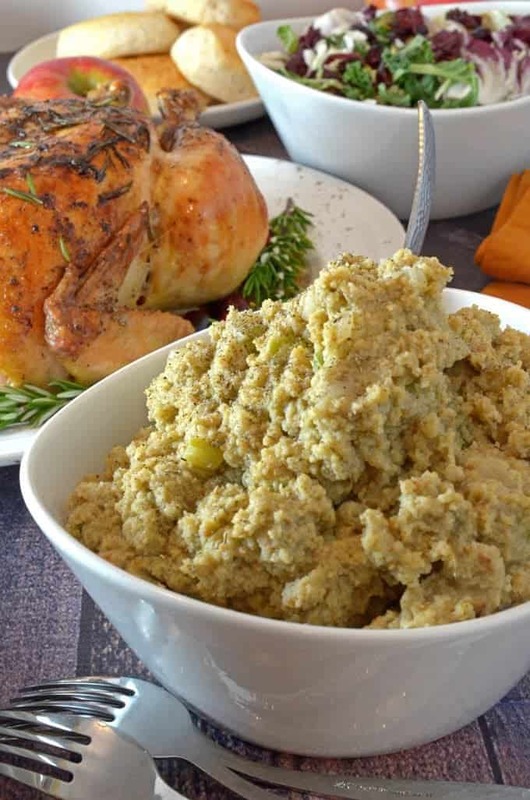 This southern cornbread dressing is perfect for Thanksgiving, Christmas, or any special dinner. Prepare cornbread and biscuits a day ahead of time. Spray large roasting pan with non-stick coating. Crumble cornbread and biscuits to a fine texture, keeping the ratio of cornbread to biscuits 3:1. Add onion, celery, eggs, evaporated milk, sage, and salt and pepper. Mix well, and add 2 to 3 boxes of the broth to reach a soupy consistency. Place covered roaster in oven for an hour to an hour and 20 minutes and then every 15 minutes, check consistency of the dressing, adding additional broth as necessary. Be sure to scrape sides and bottom or roaster to prevent any of the dressing from becoming too dry. The finished dressing should have the consistency of mashed potatoes. 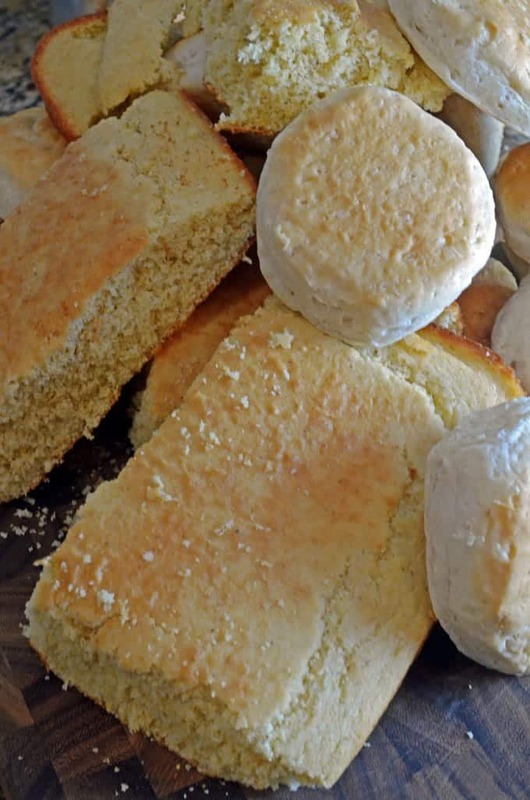 Prepare cornbread and biscuits a day ahead of time and allow to set out until ready to use. For the cornbread and biscuit mixture, use approximately 75% cornbread and 25% biscuits. Onion and celery should be of approximately equal parts, for example, a cup of each. This Southern Cornbread Dressing Recipe freezes well for later use. Simply thaw, reheat in oven, and reconstitute with additional broth as necessary. If you’re looking for a wonderful holiday breakfast entrée, you are going to love this Crustless Vegetable Quiche Recipe. It’s the perfect lighter start to a holiday of delicious food! Would you please explain exactly what you mean by 3:1 ratio. Is the 3 the cornbread or biscuit? Is it one box of cornbread to 3 biscuits? I used to make the best dressing, but somehow it just isn’t happening anymore and your recipe sounds very much like the one I made. 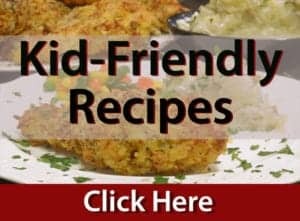 I have had to increase the amount of dressing as our family has increased to around 30, and cooking for that many people has more than likely messed up my recipe. Thanks so much. Hi Shriley. For every three parts (volume/amount) of cornbread, you want to add one part biscuit. In other words, the amount of biscuit used is about 1/3 of the amount of cornbread that is used. 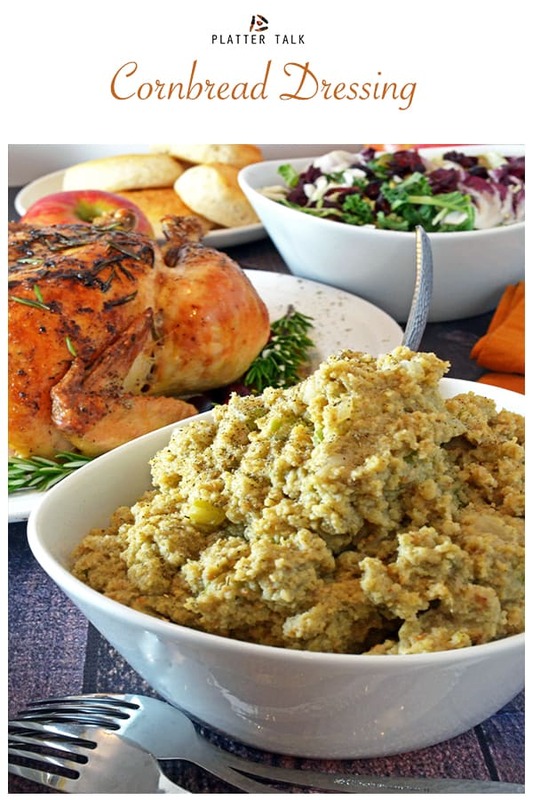 Thanks for the question and good luck with this cornbread dressing recipe! This dressing looks really good! Such an amazing side dish! Thank for the nice feedback, Frank! This fellow Yankee here has a large affection for all things Southern also! I am also a very big sage fan (as well as cornbread) so I’m completely sold on this one! I love this recipe. So delicious! Sounds like the dressing my family makes but we’ve never added milk. What does the milk do for it? I’m willing to give it a try! Milk thickens the dressing slightly and of course imparts some additional flavor. Give this a try! Yum! Such a wonderful southern side to a family celebration! Absolutely love your photos. This looks so delicious! If this isn’t comfort food, then I don’t know what is! Yummy! It’s incredibly delicious, straight from the heart of our friend April!